Scientific CMOS (sCMOS) Camera is a breakthrough technology that offers an advanced set of performance features that render it ideal to high fidelity, quantitative scientific measurement. 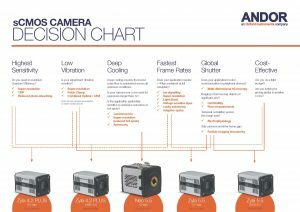 The multi-megapixel sensors offers a large field of view and high resolution, without compromising read noise, dynamic range or frame rate. In a unique -40°C vacuum cooled platform, loaded with FPGA intelligence, Andor’s Neo 5.5 sCMOS camera is designed exclusively to drive highest possible sensitivity from this exciting and innovative new technology development. Unlike any CMOS or CCD technology to come before it, Neo 5.5 sets radical new benchmarks in its unique ability to simultaneously deliver highest specifications in sensitivity, resolution, speed, dynamic range and field-of-view: true scientific imaging, without compromise. Choice of Rolling and Global (Snapshot) exposure mechanisms ensure maximum application flexibility, the latter providing a ‘freeze frame’ capture capability that emulates that of an interline CCD. The Andor Learning Center hosts a wide range of case studies, technical articles and webinars to guide you through the many features of our portfolio.